Drum roll please! I recently asked you if certain factors might make it acceptable for dental schools to favor male applicants – and fully 42% of you said yes! Some see it as discrimination, whereas others think it would help preserve access to care. We received a record number of comments from dentists on this subject. It’s not terribly surprising that gender played a significant role in a dentist’s opinion. 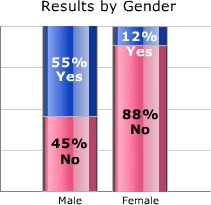 The majority of male dentists (55%) feel it would be acceptable to profile applicants based on gender. Only one in nine female dentists (12%) agrees. Geographic location also played a major role. While suburban dentists were split down the middle, urban dentists showed a preference for gender-blind admissions, while rural dentists in this survey approve of screening applicants for gender. The difference between specialists and general dentists in this survey was statistically insignificant. Why is an applicant's gender the school's business? Who says female dentists don’t give back? How about bringing care to underserved areas? Note: Survey sample included 273 respondents.